The tasting rooms and online shop were founded by the former wine director for Dean & DeLuca. If you’re wondering how to buy bottles of rare California cult wines, like Screaming Eagle, Maybach, Hundred Acre, and Dalla Valle, while skipping the waitlist, look no further than K. Laz Wine Collection. Based in Napa Valley and founded by Kerrin Laz in 2015, the Collection boasts an online store as well as tasting rooms in Yountville and at the CIA at Copia in downtown Napa. As the former wine director for Dean & DeLuca, Laz spent 12 years meeting and befriending everyone to know in California wine country—including many now-famous winemakers before they were famous like Jayson Woodbridge of Hundred Acre who used to buy Cabernet Sauvignon at the St. Helena Dean & Deluca before he even made wine, or Benoit Touquette of Realm Cellars, Fait-Main, and Kata Wines, and Philippe Melka of Dana Estates, Vineyard 29 and his own Melka Estates. “I owe my success, and the wines I’m able to carry, to the relationships that I’ve forged,” Laz told me from her tasting room in Yountville. “I knew and supported the ‘new guard’ cult wines before they were famous, like Scarecrow, Rudd, Futo, Maybach, Realm and Dana Estates,” she said, adding that as importantly, she has built just as strong of a network with the “old guard” cult wineries such as Abreu Vineyard, Eisele Vineyard, Colgin Cellars, Bryant Estate, Harlan Estate, and BOND. “Each play a vital role in our wine community and in my business model,” says Laz. She’s already forging relationships with up-and-comers like Thomas Rivers Brown who is decorated with more 100-point wines than he can count and makes wine for Round Pond, Outpost, Schrader, Mending Wall, and his own Rivers-Marie label to name a few. Other winemakers like “Helen Keplinger, Andy Jones, Becky George, John Giannini, and Robin Akhurst are just a few who are creating the next wave of great wines that many don’t yet know about,” says Laz. Kerrin Laz, setting up for a wine tasting. These cult producers “like working with us because we introduce their wines to different demographics than their mailing lists and we go deep with telling their story,” says Laz. 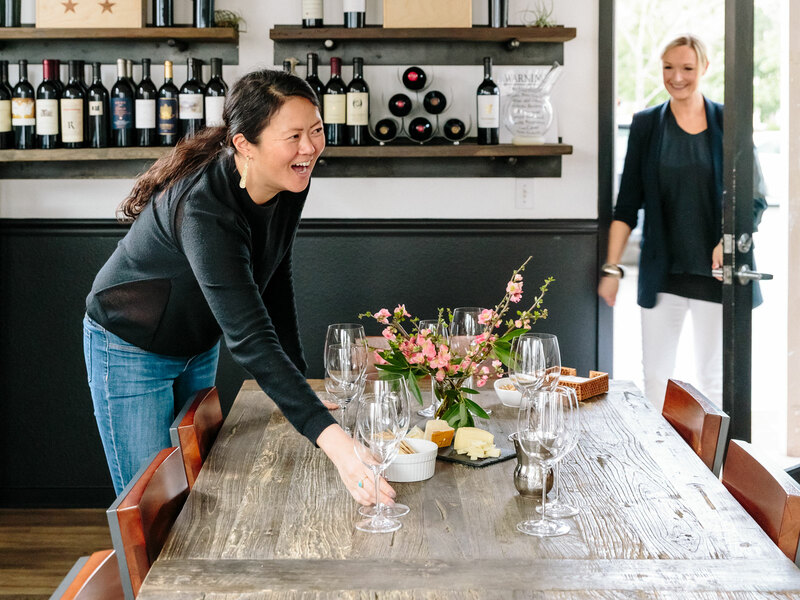 Opening a tasting room wasn’t part of her initial plans, but demand spiked, and she realized the benefits of a space where tastings could be fully customizable, from price points to varieties. “In three years, we’ve never done the same tasting lineup twice,” says Laz, which she notes is part of the appeal of visiting. Beginning last year, Laz tapped her close network of friends, vintners, and winemakers to produce Inspire Napa Valley (INV), a three-day fundraiser in support of the Alzheimer’s Association, raising funds for “both Alzheimer’s disease research and care for families affected by the disease in Northern California,” according to Laz. Food & Wine executive wine editor Ray Isle is an honorary committee member. The second annual INV wine weekend will be held on May 3-5, 2019, and because of the incredible generosity of those participating, 100 percent of the proceeds will be donated to the cause. For Laz, the event is deeply personal. In 2014, she learned that her mother was diagnosed with early-onset Alzheimer’s, which afflicts “more than 5 million Americans,” some “200,000 of which are age 65 or younger,” according to INV’s website. Before she committed to organizing INV, which she plans to produce annually, Laz wondered to herself: “What will make this really special for people spending their time and money to help with your cause? To answer that question, I decided I needed to put on something that no one has done,” she says. To begin, she limited the number of attendees. Last year’s event welcomed just 300 guests to the main event, only 75 VIP tickets, and featured just 10 live auction lots of utterly impressive quality. Chef Thomas Keller of The French Laundry fame, and the newly opened La Calenda, donated the entire VIP brunch at Ad Hoc’s Addendum. Laz brought in a Who’s Who of cult talent: Abreu Vineyards, BOND, Bryant Family Vineyard, Colgin Cellars, Dalla Valle Vineyards, Harlan Estate, Eisele Vineyard, Rudd Estate, Scarecrow, Screaming Eagle, and more. Winemaker and tastemaker Joel Gott of Gott’s Roadside and Chef Cindy Pawlcyn donated food. Vineyard manager David Abreu raised truly rare, impossible-to-find 3-liter bottles of wine from his own cellar for one dinner. Brian Flannery, a cattle rancher, known for special California Holstein cuts, donated the beef (and his wife just happens to be The director of the Ray Dolby Brain Health Center, and she’s involved in Alzheimer’s research). Screaming Eagle’s winemaker Nick Gislason shared his homemade beer for guests attending the Friday VIP dinner. Over $1 Million was raised—every penny donated. And that’s not hyperbole. Bettina Bryant of Bryant Estate offered again to be the 2019 INV winery chair and presenting benefactor. Samantha Rudd of Rudd Oakville Estate (and honorary committee member) will host “our take on an Oakville neighborhood block party,” explains Laz, hinting that it will include among the best of Rudd’s immediate Oakville neighbors. When Laz isn’t preparing for INV she’s flying to cities around the U.S. to host private sit-down tastings. As of this writing, she was off to Florida for an event. So, whether you visit K. Laz Wine Collection in Napa Valley and discover wines like Drinkward Peschon, a $79 bottle made from grapes that come from a vineyard that produces $200 bottles, or attend her INV Wine Weekend and have your first taste of Screaming Eagle along with some of Napa Valley’s best, you’re on your way to finding your new favorite bottle.